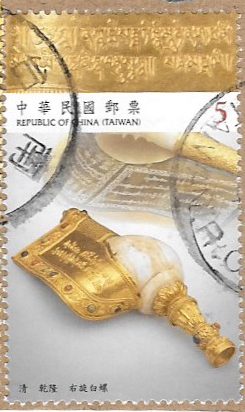 This is a $5 stamp issued in 2015 from the Republic of China, known more commonly in the west as Taiwan. The stamp celebrates the opening of the southern branch of the National Palace Museum. Right-Spiraling Conch, Qianlong Reign (1736-1795), Qing dynasty (NT$5): Commonly known as Dingfengzhu, or “stable wind pearl”, this conch is said to possess the power to protect ships at sea. It traveled to Taiwan once before with Qing troops to put down the Lin Shuangwen Rebellion and Chiayi’s Cai Qian Rebellion. This white conch, a great Indian shank, is a Tibetan Buddhist artifact. The top edge of its mouthpiece is decorated with lotus petals and scroll grass patterns in repoussé. Its silver underside is etched with praises of the conch in Tibetan and the phrase “made during Qianlong’s reign, Qing dynasty” in Mandarin, Manchurian, Mongolian and Tibetan. The outer side of the wing is gilded with gold and inscribed with praise written in Tibetan. For more connections to the letter G, check out the links at Sunday Stamps. wow, a beautiful conch! and great interpretation of the letter G! I just had to check to see if a 'right spiralling' shell was rare. apparently so. Thanks for adding the explanation, it's very interesting. Gorgeous! Absolutely gorgeous! Thanks for sharing that.